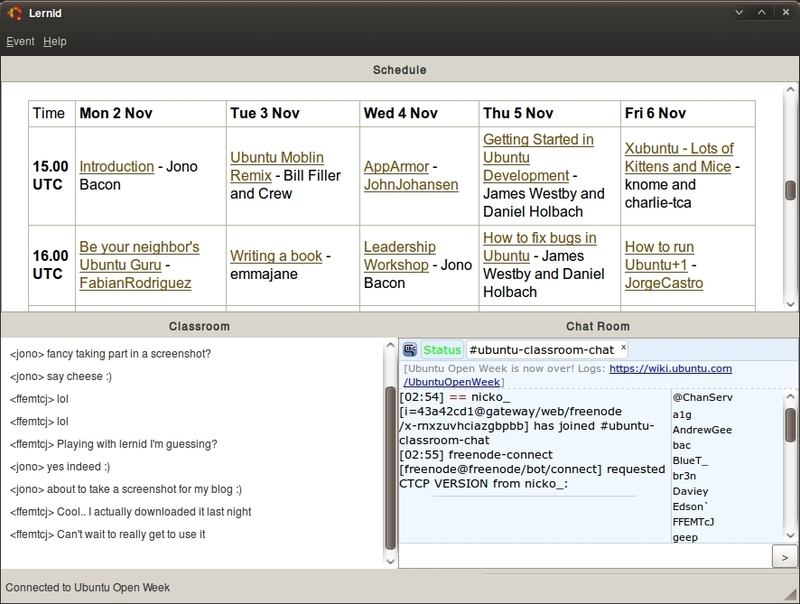 Better Classroom – the main classroom view now ditches the embedded web IRC and instead uses Telepathy. It has better scrolling and layout and importantly, is read-only, reducing the chatter, joins/parts and other fluff that clutters a session in the main classroom channel. Translated – Lernid is now available in Arabic, Asturian, Catalan, Czech, English (Australia, Canada, and United Kingdom), Esperanto, Filipino, Finnish, French, German, Hebrew, Hungarian, Malay, Polish, Portuguese, Spanish and Swedish. If you want to help translate Lernid, click here! Improved Layout – I cleaned up the interface a little and tidied up some dialog boxes. Fixed Bugs – a bunch of different bugs have been fixed and it is feeling much more solid now. My plan is to fix a bunch of remaining bugs and then upload Lernid 0.2 to a PPA so you can all try it. I am keen to get a simple yet stable verion ready for Ubuntu Developer Week. You can find out more about Lernid on it’s Launchpad page. 🙂 I got cut off there. I was saying great idea though. A quick way to collapse or hide the Schedule plane would be awesome, as once I am in a lesson all I care about is the lesson content, not the other lessons. why does “schedule” take the most space on the screen? is it really that important? Mainly because it has the largest quantity of information and the widest information span. In future versions I plan to optimize that space more effectively. So i didn’t get to it this weekend… work caught up with me in between curling matches. Fedora packages for this is at the top of my not-housework-and-I’m-not-yet-sick-of-touching-a-computer-today-todo-list. This is going to be so cool when it is finished and it will definitely beat switching between 3 windows..and pasting questions.. I hope the QUESTION function works that will be so AWESOME!!!! Great work so far can’t wait to see more of the progress! If the classroom is read-only, now I don’t have a reason to use it. The old way would’ve made QUESTION-pasting easier.